Many industries use towels on a regular basis. From bath towels at a spa to dish towels a restaurant, cotton towels are a daily necessity for many businesses. By renting your towels from Lord Baltimore Uniform, you’ll be able to manage your costs, avoid a costly initial investment, and ensure that your towels will always look fresh and clean. No matter your needs, we offer the right towel for your business at prices you can afford! From dish towels to bath towels, Lord Baltimore Uniform has you covered! If you own a bar or a restaurant, dish towels are a must-have. From wiping down counters and tables to sopping up quick spills, dish towels are an indispensable investment. But why spend all of your money buying a large supply of towels? By purchasing your own towels, you’ll not only have to find a place to store them, but you’ll also need to launder them and replace them as towels wear out. Renting your dish towels from Lord Baltimore will eliminate all of the headaches. 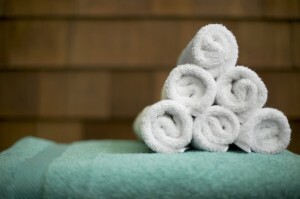 If you manage a hotel, fitness center, or spa, bath towels will be a necessity. Your guests will need to dry off in comfort after their shower, so providing comfortable and clean bath towels is important for making sure that they feel taken care of. Our bath towels will be laundered and folded for you, so you won’t have to worry about wasting expensive employee time on towel logistics. Virtually every business needs to be concerned with cleanliness, and microfiber towels are the best way to keep your facility germ-free. Microfiber is naturally antibacterial and doesn’t require the use of cleaning chemicals, so you’ll save money on your cleaning costs too! For over forty years, Lord Baltimore has provided reliable, cost effective towel rental services up and down the East Coast, including Maryland, Washington DC, Northern Virginia, Southern Pennsylvania, and Delaware. We are an independently owned company and we are completely confident in our ability to provide you with service above and beyond rental industry standards. To learn more about how Towel Rental can make your business more effective and economical, please contact Joe Bateman at Lord Baltimore by calling 800-292-1224 or visit LordBaltimoreUniform.com. We also handle towel rental for gyms and salons; apron, towels, uniforms and mats for restaurants; and uniform, shop towel, fender cover and mat rental for manufacturing and automotive industries. This entry was posted on Thursday, September 1st, 2016	at 8:07 am	. You can follow any responses to this entry through the RSS 2.0	feed. Both comments and pings are currently closed.